Also called TFM Scotch Bonnet. TFM is supposed to stand for Trenton Farmers Market which is in the State of New Jersey in America. The market has some native Caribbean vendors and customers like some markets in New York and Florida. 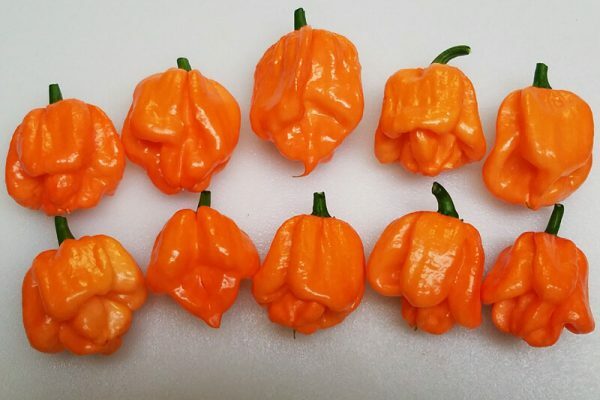 This is where this variety of Scotch Bonnet came into the hands of American chile enthusiasts. 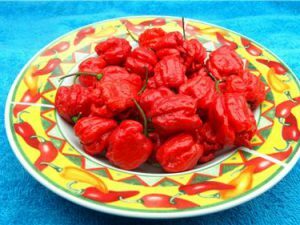 Everyone has different tastes so we cannot claim this to be the best or tastiest of all Scorch Bonnet peppers. But most who have tried the Scotch Bonnet TFM do say it’s delicious and one of the best! 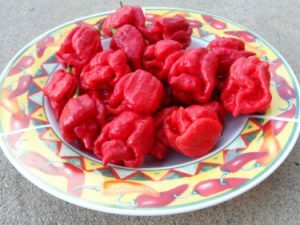 A must grow if you love Scotch Bonnets! It has fruity tones with habanero heat. But not a punishing heat. 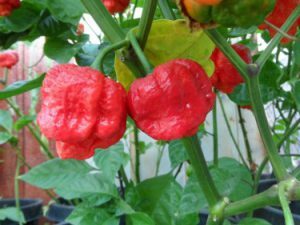 The TFM Scotch Bonnet Chile plants grow over 4 feet tall and are very prolific. The peppers ripen from green to a yellow orange. 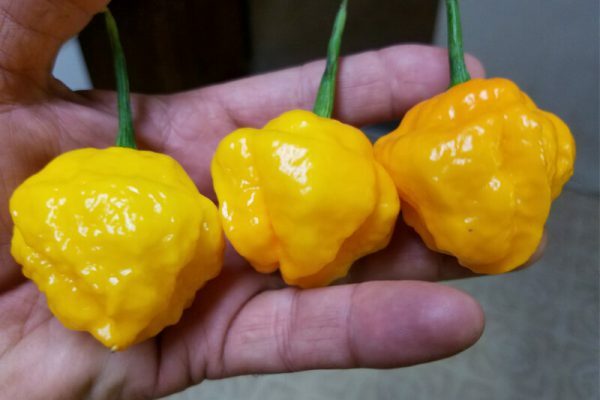 Scotch Bonnet Freeport Orange-(Capsicum chinense)-On the Internet pepper forums there is a man named Greg who loves Scotch Bonnets. About 2012 he obtained the seeds of this delicious Orange Scotch Bonnet type from Freeport, Bahamas Islands. One of the most delicious peppers I have ever tasted. It is very fruity with a smooth habanero level burn. If you like Scotch Bonnets this is a must grow. The peppers ripen from green to orange. They are extremely productive. Okay insanely productive! The Scotch Bonnet Freeport Orange Chile plants grow just over 3 feet tall. This Scotch Bonnet was brought to the Chile community by grower Erin Mason. Erin passed away in August 2015. To honor his memory I have copied here some info about him that I obtained from his friend and fellow grower Gary Montcalm. In August 2015 in Amarillo, Texas musician/songwriter/silversmith/chilehead Erin Mason, known to many on the Hot Pepper Forums as P. Dreadie, passed away. Erin was an enigma, one of the most interesting and creative, yet gentle and loving guys Gary ever knew. Many of us growers may be unaware that he played harmonica in one of the original Austin, Texas bands of the early 1970s “Cosmic Cowboy” era, Alvin Crow and the Pleasant Valley Boys. When Erin decided to step off of Alvin’s perpetually-touring bus and return to Amarillo, he travelled to Jamaica, fell in love with the Reggae beat, collected the best Scotch Bonnet fruit he could find, and his alter-ego Papa Dreadie was born. 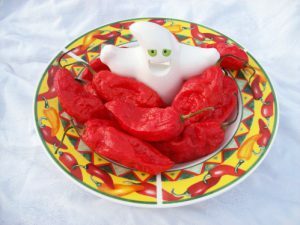 In 2013 Erin sent Gary a few pods of the Scotch Bonnets he had been breeding, carefully selected descendants of the original fruit he brought back from the Caribbean all those years ago. Gary harvested every single seed from those pods, and stored them away, as I focused increasing attention on other varieties. When his wife Liz gave us the news that Erin had passed, Gary knew what he had to do with those seeds, a community grow in his memory. Gary then shared seeds to pass on Erin’s legacy. The Papa Dreadie also was called Scotch Bonnet Select as Erin never grew too many varieties in his garden. Instead he was devoted to growing only a few selecting the best to grow for future generations. 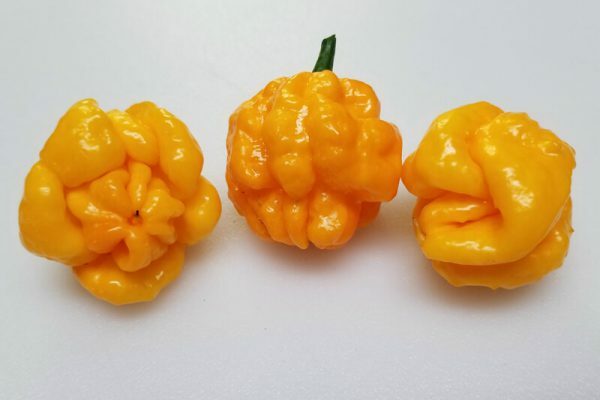 The Papa Dreadie Scotch Bonnet pepper has a nice Scotch Bonnet shape and even gets some bumpy pimpling skin. The Papa Dreadie Chile plants grow over 4 feet tall.